Ernest Hemingway spent part of his first 22 years in Northern Michigan. Years later, Hemingway fans flock to the Petoskey area to walk in Hemingway's footsteps. And there are so many places in Northern Michigan to follow Hemingway. He and bride, Hadley Richardson, loved Horton Bay. The Horton Bay General Store. established in 1876, is the center of business and social life in the village today as it was in Hemingway's day. 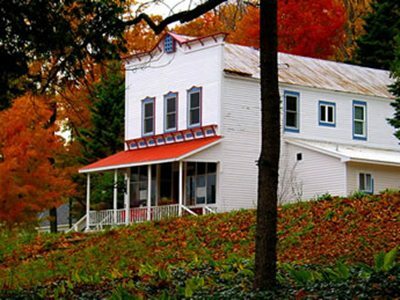 Hemingway frequented the store as a boy and a young man and described it in the story "Up in Michigan." The store may also be seen as Mr. Packard's store in "The Last Good Country." Hemingway photos and memorabilia are still displayed here. Hemingway spent the winter of 1919-20 in Northern Michigan and so many favorite places still here today were here when Hemingway was. He once stayed at the Perry Hotel, played billiards at what is now the City Park Grille, spent hours writing in the Bay View Association, and, of course, summered at the family cottage, Windemere, on Walloon Lake. Each summer, the family arrived by train in Harbor Springs where they transferred to a "dummy train" that carried them to Petoskey and then Walloon Lake. The Petoskey depot is now the Little Traverse History Museum which includes a Hemingway exhibit. Each fall, the Michigan Hemingway Society hosts a conference in Petoskey where conference goers retrace Hemingway's footsteps and discuss his impact on the literary world. Ernest Hemingay's mark on the world includes Petoskey and is embraced here. If you're a Hemingway fan, Northern Michigan has much to offer.